Quick disassembly for storage or travel. 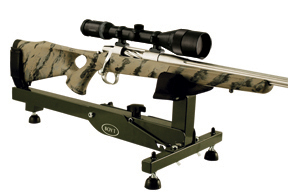 Fully adjustable for elevation and windage, all steel construction and can also be used for cleaning or gun maintenance. Overall size: 24" x 11.75" x 8.5".